Widely considered a hoax, this letter was mailed to the San Francisco Chronicle on April 24th 1978, with the author declaring "I am back with you." 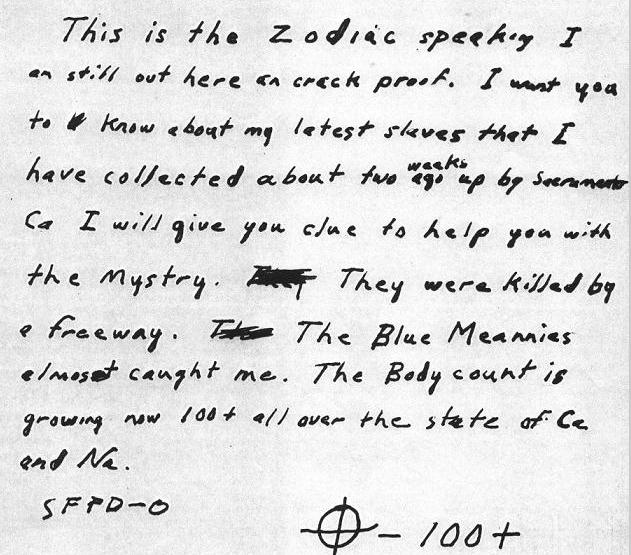 This letter arrived after a hiatus of just over four years from the last confirmed communication by the Zodiac Killer, widely considered to be the Exorcist Letter, mailed on January 29th 1974. 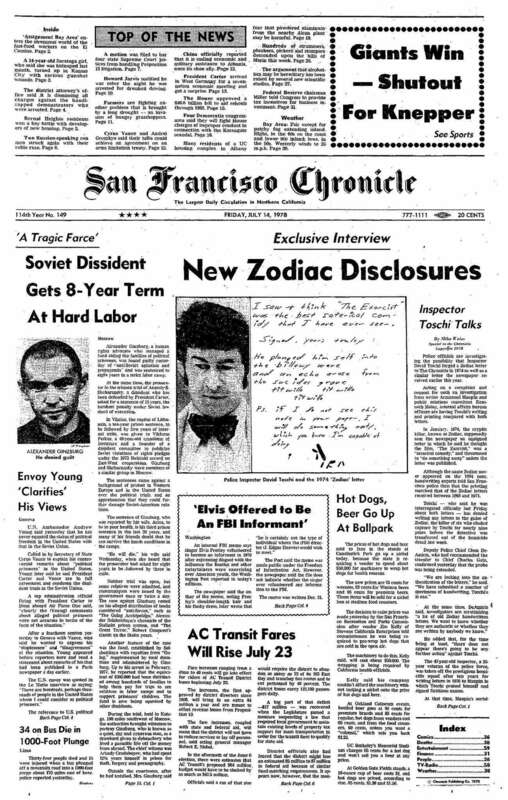 Paul Avery had since left the Chronicle, joining the Sacramento Bee daily newspaper in 1976, so the letter was handled by another reporter Duffy Jennings, featured here in a short Zodiac documentary about the Paul Stine murder. This letter was thought to have been 'hoaxed' by San Francisco Police Inspector Dave Toschi. ​San Francisco Chronicle columnist Armistead Maupin who joined the San Francisco Associated Press in 1971, and went on to launch nine novels that included the popular Tales of the City series, had suspicions that fan mail he received for the series may not be genuine and may have been forged by Dave Toschi. ​Armistead Maupin had first met Dave Toschi in 1976 while he was writing the Tales of the City series. Wanting to energize the series with a murder mystery element he contacted San Francisco Chronicle reporter Bob Popp, who then introduced him to Dave Toschi. The police inspector would make a debut appearance in Tales of the City on September 10th that year, with a character based on his attributes. Further episodes would follow under his real name as a friend and confidant to Armistead Maupin's fictitious detective Inspector Henry Tandy. Things eventually came to a head when Armistead Maupin noticed a similarity between the suspicious fan mail he received for the series and the 1978 Zodiac correspondence and reported it to Dave Toschi's superiors. The Inspector was suspended from his position on July 10th 1978 and an investigation was begun almost immediately by Deputy Chief of Investigations Clement DeAmicis. The transfer was announced by Chief Charles Gain, who told reporter Duffy Jennings that 'Toschi did write letters praising himself, signed fictitious names to them and sent them to former Chronicle writer Armistead Maupin in 1976.' Contacted at home immediately after the transfer Dave Toschi stated "I wrote no Zodiac letter. I don't need another letter, it only brings me tons of extra work. It's a strain enough being in homicide." He went on to elaborate about Armistead Maupin "they were a silly mistake. He made me the hero of the story and it was fun for me and my family. So I sent some notes, three or four, saying how good it was that he put a real life homicide inspector in the column. It was kind of like sending fan mail to myself. It was done in a harmless way. I didn't think anyone was going to be hurt by it. It was a vain thing to do, not an intelligent thing." 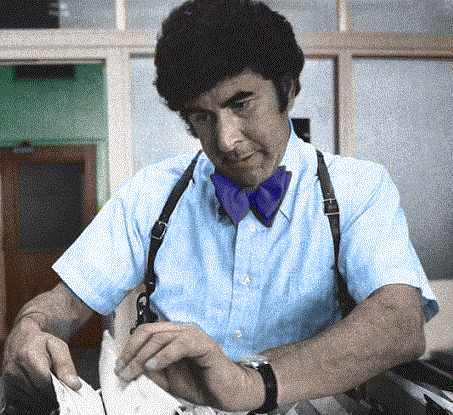 Despite Dave Toschi admitting the fan mail, he was ultimately cleared of faking the Zodiac letter. KRON News report from July 11th 1978 at the San Francisco Hall of Justice featuring Armistead Maupin. ​KPIX News report from July 11th 1978 by Ed Arnow at the San Francisco Hall of Justice. Suggestions were that Dave Toschi had created the latest letter in an attempt to keep the dwindling story of Zodiac alive in the media. After early perceptions that this letter may be genuine Zodiac correspondence, the letter has subsequently gathered its fair share of detractors. Sherwood Morrill, a questioned documents examiner who analyzed many of the Zodiac letters, declared the 1978 letter to be genuine correspondence from the Bay Area murderer, albeit a further three document examiners came to the opposite conclusion. The San Francisco Chronicle ran a front page article on July 14th 1978 suggesting that Dave Toschi may have also been responsible for writing the January 29th 1974 'Exorcist' letter. The 'Exorcist' letter was without doubt a response to the San Francisco Chronicle article entitled 'Weird Goings on at the Movies,' authored by Paul Avery and published on January 11th 1974, detailing the audience reaction to the recently released Exorcist movie in 1973. The 'Exorcist' letter would arrive only eighteen days after this article. Deputy Police Chief Clement DeAmicis stated "We are looking into the authentication of the letters. We have submitted a number of specimens of handwriting. Toschi's is one". Referring to other Zodiac correspondence he continued "We want to know whether they are authentic or whether they are written by somebody we know." 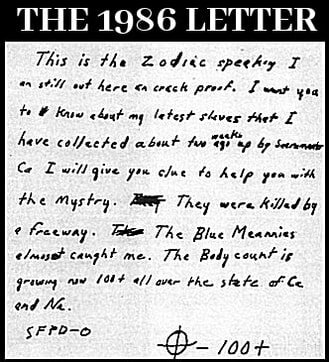 Had the 1974 and 1978 letters been 'faked', it would place the last confirmed correspondence of the Zodiac Killer back to March 13th 1971, when the killer mailed the 'Los Angeles' letter inferring a connection to the Riverside murder of Cheri Jo Bates. ​Here is a list of envelopes processed for DNA, minus the envelopes from July 31st 1969, as they had been misplaced at the time this list was compiled. It can be noticed that the 1978 'I am back with you' letter has yielded DNA material, but is attributed as not being an authentic Zodiac letter. Since authorities now claim to have Zodiac's partial DNA profile, it is fairly certain that this letter has now been compared and effectively ruled out, laying to rest any debate about its authenticity. What is apparent in the DNA chart, is the evidence of "few cells" in the widely accepted Zodiac letters up to the Kathleen Johns letter on July 24th 1970, after which there is an evident departure to "cells found" on the Kathleen Johns, Little List, Exorcist and 1978 letter. The Halloween Card, Los Angeles letter, Pines Card, Monticello Card, Citizen Card, Red Phantom letter and 13 Hole Postcard seem to have no attribution in comments. Admittedly many of these are postcards, hence may not have been tested or attributed on this list due to the absence of an envelope, but what we are left with, is that subsequent to the June 26th 1970 Button letter, biological material discovered on the communications appears more prevalent. It is therefore conceivable that if the Zodiac Killer avoided licking his stamps and envelopes, the Button letter may have been Zodiac's last authentic correspondence, unless he willfully attached himself to the Cheri Jo Bates murder by sending the 'Los Angeles' letter on March 13th 1971. Some people believed and still do, that the prime Zodiac suspect Arthur Leigh Allen to be responsible for the 1978 Letter based upon the fact that during the four years between this communication and the previous Exorcist Letter, he had been serving time in a psychiatric facility in San Luis Obispo County. On September 27th 1974 Allen was arrested by the Sanoma County Sheriff's Department for child molestation, involving a young boy and sentenced on March 14th 1975, but after his release from the Atascadero State Hospital on August 31st 1977, the 1978 declaration of "I am back with you" appeared to be marking his return to public notoriety. Fingerprinting, and in later years DNA, seemingly ruled out Allen as a suspect in the Zodiac case, although suspicions still linger to this day. 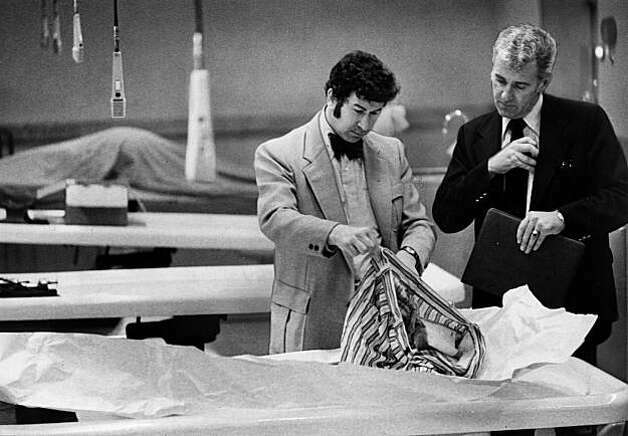 The San Francisco Police Department compared a DNA sample taken from Arthur Leigh Allen shortly after his death in 1992, that ultimately provided no match to a sample recovered from the 1978 envelope. On the left is another purported Zodiac correspondence entitled 'The 1986 Letter'. Below I have discovered the only crime mentioned by the letter that matches by date, location, number of victims, and more importantly a crime that exhibited many of the traits of Lake Herman Road and Blue Rock Springs. ​The date was Tuesday April 22nd 1986, when Laotian couple Koy Ien Saechao (48) and Choy Fow Salee (40) were traveling back on the two and a half journey to their residence in Dorman Road, Yuba City after visiting their son in a Merced CA hospital, situated in the area of the San Joaquin Valley of Northern California. They were only 45 minutes from home when it was believed they had opted to take a rest on the roadside edge, near the interchange of Highway 99 and I-5 Sacramento and unfortunately for them, a merciless killer was in the vicinity. Sacramento is situated approximately one hours drive North-East from Vallejo CA and one hour and forty minutes due East of Lake Berryessa, and mentioned in two letters by the Zodiac Killer. Firstly, in the dubious Fairfield Letter postmarked December 16th 1969, it was claimed by the author he would go on to kill at least 38 more people, including three in Fairfield CA and nine in Sacramento. Fairfield is on a direct route from Vallejo through to Sacramento and within easy traveling distance for the Zodiac Killer, if indeed he was a resident of the Benicia, Vallejo or San Francisco area at the said time period. More crucially though, the 1986 Letter was relevant to the date and area where Koy Ien Saechao and Choy Fow Salee were gunned down, likely mailed on Tuesday May 6th, despite an unclear postmark. The author of the 1986 Letter stated that these latest victims were killed 'about two weeks ago'. Exactly two weeks prior to May 6th would have been April 22nd 1986, the exact date of the cold blooded murder of Koy Ien Saechao and Choy Fow Salee. The method of execution here is eerily familiar to that of the Lake Herman Road double murder of David Faraday and Betty Lou Jensen on December 20th 1968 and the Blue Rock Springs Park murder and attempted murder of Darlene Ferrin and Michael Mageau on July 4th 1969. All couples ambushed in their car, and although not substantiated, it seems likely the killer approached this couple from behind in his vehicle, due to the locality of the crime. Two days after the Saechao/Salee murders and not far away, Jimmy Lee Rowe was also parked up on the shoulder by the Exposition Boulevard exit and Highway 160, Sacramento, where he was found gunned down in his pick up truck. His killer has never been apprehended. The most interesting aspect of the Laotian couples murder though, was that shortly afterwards a 'Mystery Man', thought to be a hitchhiker, flagged down a California Highway Patrol Officer in East Nicolaus and informed him of an automobile accident, at the precise location the couple were eventually discovered. He was later sought for questioning in connection to the double murder on Highway 99, but he failed to come forward and his identity remains unknown to this day. ​The author of the 1986 Letter stated 'I will give you a clue to help you with the mystry, They were killed by a freeway. The Blue Meannies almost caught me'. Had the murderer already given the clue about his own identity to the California Highway Patrol Officer and he indeed was the 'Mystry' Man. Furthermore was the alluding of the 'Blue Meannies almost caught me', as just another case of the Zodiac Killer toying with the long suffering police and authorities, that he seemingly enjoyed ridiculing during his long campaign of terror. In fact the letter matches the crime almost perfectly. The author states "latest slaves", indicating more than one person was killed, they were killed "by Sacramento", they were killed "by a freeway", the date of the crime of "two weeks ago" was correct, the method of execution bore striking similarities to previous Zodiac crimes and the helpful "mystry" man, being a concerned citizen has never been identified. A relative of Koy Ien Saechao and Choy Fow Salee said "We don't want to get killed in the United States, we want to live here for freedom". Let us hope one day they find a resolution to the answers they desperately yearn, and the killer, whomever they may be, finds that freedom will one day be no more. This the Zodiac speaking. I am crack proof. Tell herb caen that I am still here. I have always been here. Tell the blue pigs if want me I will be out driving around on Halloween in my death machine looking for some kiddies to run over. Cars make nice weapons. The pigs can catch me if They can find me out there. Just like in the movie The car. Tell the kiddies watch before They cross the street on halloween nite. Tell Tochi my new plans.